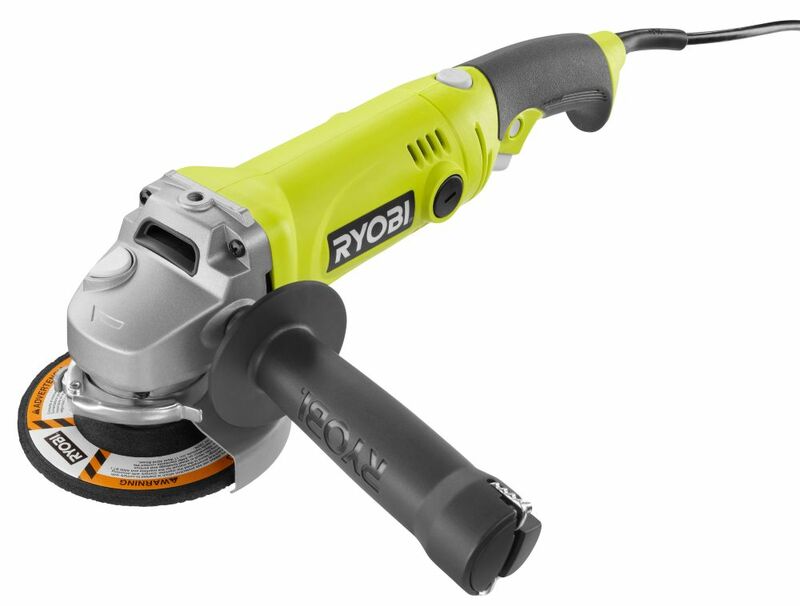 The Ryobi 4 1/2-inch Angle Grinder features a side handle that rotates left and right to offer 3 unique working positions, helping you use the grinder in a variety of applications. The ergonomic grinder handle features GripZone technology for steadiness and comfort. The grinder runs at 11,000 RPM to deliver powerful grinding performance. The Bosch 1375A 4-1/2 In. Angle Grinder features a powerful 6.0-amp motor that produces 11,000 no-load rpm, making this compact grinder a powerhouse tool. It was designed for concrete contractors, vehicle fabricators and other professionals who need a compact grinder. With a well-designed grip, lock-on slide switch, two-position side handle and 11,000 no-load rpm, this workhorse can get the job done. It is well suited for metal fabrication, concrete restoration, pipe fitting and more. It uses Service Minder brushes that stops the grinder when preventative maintenance is required and epoxy-coated field windings, for longer tool life. The lock-on slide switch, two-position side handle and 3.75 Lbs. weight add to user comfort and control. The DWE4222N 4.5" Small Angle Paddle Switch Angle Grinder with Brake and No-Lock On slows wheel 50% faster once trigger is released as compared to the DWE402 with DW4514 Wheel. The E-Clutch feature activates in less than a tenth of a second when a wheel pinch/stall event is detected. Includes Lanyard Ready connection point, One-Touch Guard and Dust Ejection System. 7.5 Amp 4.5-inch Corded Angle Grinder The Ryobi 4 1/2-inch Angle Grinder features a side handle that rotates left and right to offer 3 unique working positions, helping you use the grinder in a variety of applications. The ergonomic grinder handle features GripZone technology for steadiness and comfort. The grinder runs at 11,000 RPM to deliver powerful grinding performance. 7.5 Amp 4.5-inch Corded Angle Grinder is rated 4.3 out of 5 by 203. Rated 5 out of 5 by Al from A well made grinder and a reasonable price! The full... A well made grinder and a reasonable price! The full size on/off switch/trigger is fantastic, and the swiveling handle is an advantage. Plenty of power, and the adjustable/removable guard is very easy to use. I definitely recommend this Ryobi grinder! Rated 4 out of 5 by TIM from Great buy!... Great buy! Rated 4 out of 5 by Chewy from Comes with good instructions to get started quick. My first use was to cut concrete with a concre... Comes with good instructions to get started quick. My first use was to cut concrete with a concrete disk. And it cut it fast. Changed blades and tried it out on some metal scraps too.Works good and it wasn't bogging down unless really trying to force it. It will be there when something else comes up.Only draw back is depth of cut is not that deep because of snap on guard cover stops tool from cutting deeper,but knew that before buying it. Rated 4 out of 5 by Clifton from Looks to to good quality. For the price. ... Looks to to good quality. For the price. Rated 5 out of 5 by HomeDepotCustomer from Good little grinder for the money.does what is asked of... Good little grinder for the money.does what is asked of it. Rotating handle is nice feature. Best of all is no paddle switch like some other small grinders. Where is the freakin battery? The specifications list: Batteries Included Battery Amp Hours: 1 Battery Power Type: Lithium Ion Blade Diameter (In. ): 1 But I cannot find a battery or one inch blade anywhere in the box! Hi Docbill, This item does not include a battery nor a blade. The 6.5 angle grinder is a corded product and doesn't work with a blade. We are working on correcting the web copy, we are sorry for the incovenience. Thanks! Can I use this grinder to remove thinset on the concrete patio after removing tiles? The outdoor tiles were secured to concrete patio using thinset. After tiles were removed, tough thinset remains which is a lot of work to remove using chisel. If the layer contains a wired mesh, then I would recommend against it. You don't want bits of the mesh coming loose and flying at you at 11,000 rpm. If not, this tool seems perfect for the job. The only hard part is selecting out which wheel should be used. What size is the arbour?